Otherwise we always have to manually insert an EmptySpaceItem. See attached example. 2. Is it possible to define column in the Layout= string? but you can add it yourself. 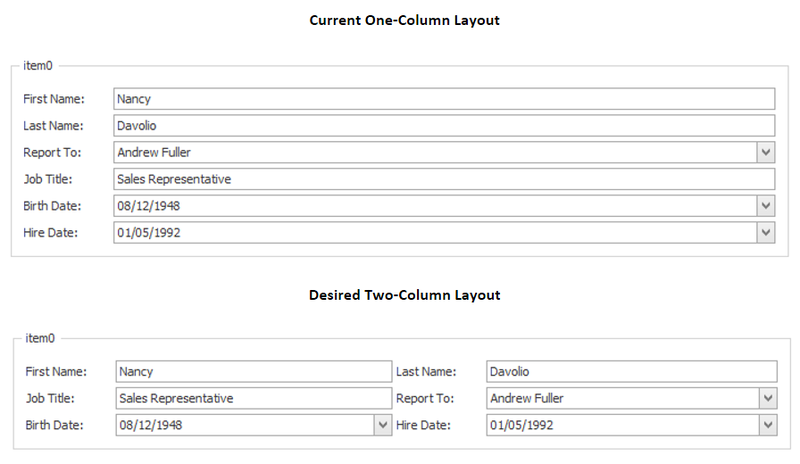 >> Is it possible to define column in the Layout= string? Please could you provide us with more information about this issue? The column is not an issue, but a question about SmartDesign feature. I was wondering if it's possible to supply column information in the layout string. Please see attached image for example. but if in the future there will be more such proposals we will do this functionality. If you need, we can give you advice for solve the issue with the Column Layout. You can't add your response to the ticket if the window was open longer than 30 minutes (Cookies are outdated because).